"@boby_toss: No, I'm not the developer and I'm not gonna lie, I just realized that both my Nick and the WizMouse app start with WIZ, that's a funny coincidence :) There's another freeware app called MouseHunter it's a good one too." 1. Who the fxxk is boby? 2. WizKey is by the same developer... a remarkable coincidence, is it not? 3 WizMouse writes to the registry. @boby_toss: No, I'm not the developer and I'm not gonna lie, I just realized that both my Nick and the WizMouse app start with WIZ, that's a funny coincidence :) There's another freeware app called MouseHunter it's a good one too. @Wizkey: So, are you the developer of Wizmouse? Would be nice to announce it, if so. 1. The amount of memory it uses is lower and doesn´t increase that much when you work on several windows. 2. 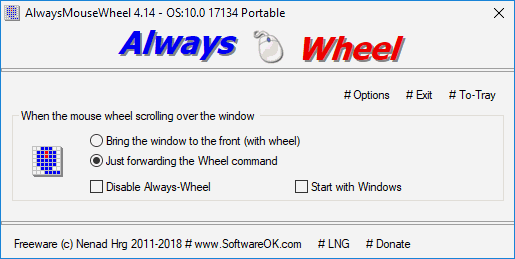 The responsiveness of the scrolling is way better and the window titlebar doesn´t blink like AlwaysMouseWheel. Thank you for this little gem. That is the way a mouse should behave in a windows manager. This used to be available in a Windows Power Tool under Windows XP. FYI if you already use AutoHotKey, you won't need this. Just want to share that I solved my VBE scroll problem with VB6MouseWheel.EXE from MS. I second that AlwaysMouseWheel is a must have! Great stuff! Good stuff. Too bad it does not work with VBScroll which i need to run. Has anyone gotten this to work in excel vba editor? Awesome, awesome utility. Thank you! Perhaps a feature request is in order? EG: on/off hot-key, or an exclusion list (manually populated txt) to exclude applications such as Opera. Just contact the developer he developed this application based on a user request and is likely to help if possible. Works well in apps. that don't scroll the window under the mouse, but borks the Mouse Gestures in Opera, e.g. R-click-scroll to change tabs. Pity, as it is a useful utility. This is a 'must have' if you are using Q-Dir (or any file manager), makes scrolling through the different windows much easier!